Young man born to Jewish mother but raised in Arab village returns to Judaism. 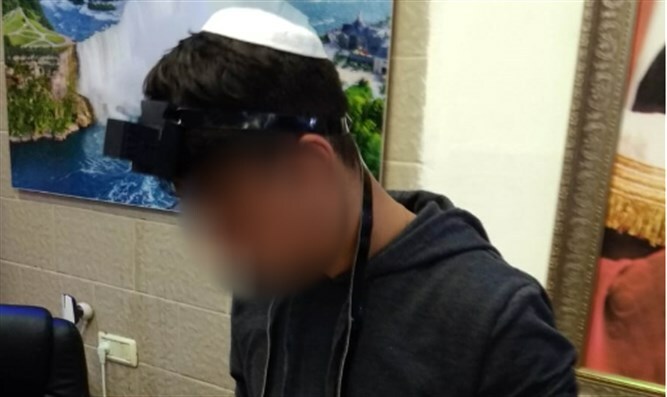 No family came to accompany 19-year-old Kamel when a Brit Yosef Yitzchak organization member performed his hatafat dam procedure, drawing a drop of blood with a pin-sized lance for those who have been circumcised but not for the sake of the Covenant of Abraham. At this time he was given his new Jewish name, Binyamin. No family member was there, but members of Yad L'Achim who accompanied Kamel (Binyamin) in the past two years stood by him now, a day later, when he immersed in a mikveh to accept Judaism before the judges of the Haifa Rabbinical Court, and thus completed his "return to Judaism" ceremony - a special track for Jews who left their religion and are now returning to Judaism of their own free will. Binyamin was born in a Arab village in the north of the country to a Jewish mother who immigrated to Israel from the former Soviet Union, and an Arab father. Two years after the mother converted to Islam and married the same Arab in an attempt to start a new life in the Land of Israel - to which, ironically, she immigrated from Moscow so she could live as a Jew. After years his mother divorced the Arab father after undergoing a life of suffering and violence, but the Arab father, who was well versed in local law, succeeded in deceiving her and Binyamin was transferred to his custody. Binyamin, who grew up as Kamel, was educated in Islam and grew up as an Arab in every respect. The torture he suffered as a son of a hated Jewish mother caused him to flee the village when he was 15 years old and roam the streets of Acco and Haifa. His life quickly degenerated into brawls and wars of survival until he was directed to Yad L'Achim by a passing Jew who heard his story and understood that he wanted to return to the Jewish People and open a new and better chapter in his life. Yad L'Achim hurried to meet with Binyamin and immediately began combined treatment: First, a suitable accommodation was found in an educational institution for young people from difficult backgrounds. At the same time, the organization worked to connect him with a mentor who was especially assigned to him and taught him the Hebrew language and later Judaism and Jewish heritage. Yad L'Achim even purchased a pair of tefillin for him, helped him find suitable work during the evening hours, and gave him coupons every month for food, clothes, and personal furniture. Only a half-year after he had been picked up from the street, with much help from Heaven and greater willpower than most, Binyamin knew how to open a siddur or a Chumash and read them like one accustomed. The decisive stage of his return to Judaism also recently ended. The request submitted by Yad L'Achim to the Beit Din for Binyamin's return to Judaism encountered difficulties due to missing documents relating to the Jewishness of his mother, who had no family member or acquaintance in Israel. In the end, after many efforts by Yad L'Achim overseas they managed to obtain some documents, and the court decided on a special genetic test that proved beyond any doubt that Binyamin was 100 percent Jewish and derived from a Jewish family in Poland. "Binyamin is waiting impatiently for the official document of his return to Judaism, and at the same time he began to observe Shabbat and observe kashrut and so this time too, despite the difficult personal story, we were moved to see that Israel is aware of G-d and His Torah," Yad L'Achim said this week. "These success stories only encourage us to continue to care for thousands of Jews with similar life stories who are desperate for help. We won't rest until we can bring them home."